Cruise along India's vast coastline and sample the varied spices and authentic cuisines from around the subcontinent, at the award winning Samudra, our Indian coastal restaurant at Trident, Chennai. Sample the fresh catch of the day as our chefs prepare a menu featuring fine coastal delicacies, such as Doi Maach from Bengal, Meen Pollichathu from Kerala, or Chettinad Spiced Crab Cakes from Tamil Nadu, as well as pure vegetarian Keralan specialities like Nilgiri Vegetable Qorma, Andhra Masala Okra, Peanut and Jaggery Upma and authentic local sweets including Elaneer Payasam. 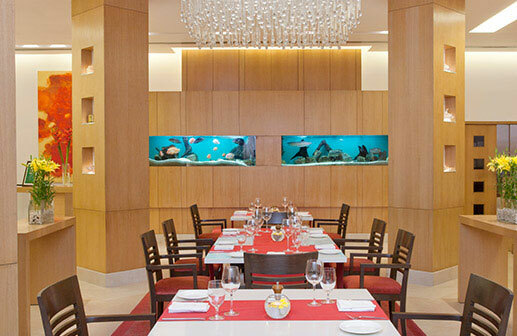 Every dish is a flavourful journey, complete with our signature hospitality, contemporary décor, and intimate setting. Open from 7pm to 11.30pm, Samudra is the perfect venue for a romantic dinner for two, a treat for the family or a business dinner. Malabar Prawn Curry - Our take on the traditional Malabar prawn curry with appam is a must-try at Samudra. Refreshed Summer Menu - Enjoy an array of new dishes with the season's freshest offerings from the coast, along with our classic dishes, in a new avatar this summer. Crab Cakes - Enjoy deliciously spiced Chettinad Crab cakes, a coastal classic with our chef's special twist.